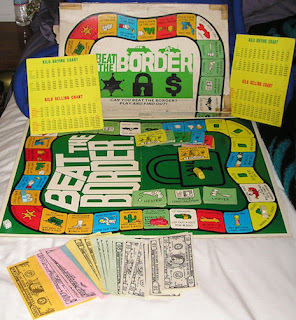 In 1971, a company decided it might be a good idea to release a Monopoly-style board game knock-off called Beat the Border, reports Dangerous Minds. The objective of trafficking in the game was far less fraught with danger and intrigues—and less rewarding, although one’s friendly neighbourhood pusher was careful to put out the disclaimer that it was all in good fun and reinforce the message that drugs are bad and the “dope” peddled was left up to imagination—though handy conversion charts were included. In these times, rather than exploring one’s hidden fantasies of being the head of a Mexican drug cartel—which does not strike me as particularly wholesome family-fun for the 1970s, in the same rather vicious spirit, I detect “Run for the Border” to be a new gladiatorial reality television franchise for the presidential-pretender.